In light of the recent storms in the Northeast, we wanted to update this article on emergency preparedness for pets with some new information. Our thoughts are with everyone struggling to recover from Superstorm Sandy, and we’re grateful to all those who have sent money, supplies, and volunteers to the area. Don’t forget that you can donate to the American Humane Association (text HUMANE to 80888) and Red Cross Disaster Relief (text REDCROSS to 90999) via text message. While we can’t always know or plan ahead for everything in life, it’s good to have some idea of what we will do in case of an emergency – and that goes for humans as well as the furry members of the household. Whether or not you live in an area that’s prone to seasonal natural disasters like tornadoes, hurricanes, or forest fires, things like house fires can occur no matter where you live. And the time to plan for an emergency like that is absolutely not when you’ve discovered the curtains are ablaze. Putting together a family emergency plan takes fore-thought, and that’s especially true if you’ve got pets to work into the equation. Your pet should wear a collar that has an ID tag including your name, telephone number, and an additional emergency contact. Microchipping your pet is also strongly encouraged; tags can get torn off or collars removed – a microchip will help make sure you find your way back to your pet if you get separated. Having a pet emergency kit with some pet food, water, any medications your pet takes, litter/sanitation supplies, a blanket/pillow, a toy or two, an extra leash, collar, pet first aid supplies, a photograph of your pet, and an extra set of tags at the ready can save worry over where everything is when you’re in a panic. 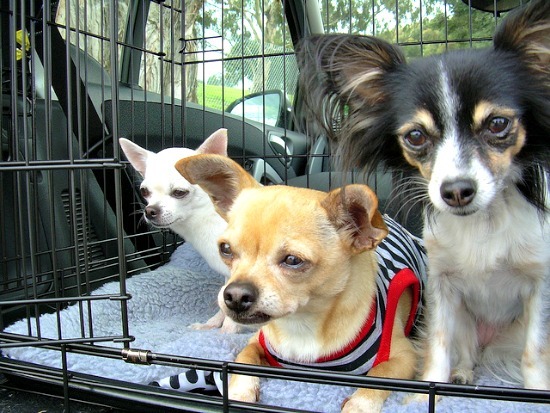 Pet carriers should also be in handy locations – not the deepest recess of the attic – and should be designed for easy transport. It’s also good to look up the locations of nearby pet-friendly hotels in case you need to evacuate quickly. Plan ahead and find out if there are emergency animal shelters in your area if the nearest evacuation site does not allow pets. If you have no choice but to leave your pet behind, be absolutely certain rescue workers know there’s a pet inside the house. The ASPCA has free Pet Safety Packs that include a sign you can put in your window indicating there’s a pet inside. Even if you’re not in a situation where you need to evacuate, these stickers can be extremely important if there’s an emergency situation at your house when you’re not there. For instance, if your home catches fire, firefighters would be able to know in an instant that there were animals indoors that needed to be rescued. And if you’re able to safely get your pets out during an emergency, it’s a good idea to try to write the word EVACUATED across the sticker so rescue workers know they can move on to the next house. Birds need a small and secure cage, reptiles and fish need a lightweight plastic tank instead of their big glass aquarium, and small animals like hamsters need a carrier where the cage doesn’t have openings so large they can escape. Depending on the weather in your area, prepare for the needs of your pet and climate controls that are necessary for their well-being. If your pet needs something like a heat lamp, a heating pad can serve in emergencies. Paper towels, an old towel, and a blanket are always good to have set aside specifically for your special pet. While it’s good to keep a photo of your pet in his/her emergency kit, it’s also smart to store images of your pet on your phone. You can also scan and save your pet’s medical records on your phone, along with contact information for your vet or emergency vets in your area. There are iPhone and Android apps you can download to file pet records, or you can just use a note-taking app like Evernote. You can even email medical records and pet photos to yourself so you can access them remotely, whether you have your phone with you or not. If you live in an area where things like tornadoes, hurricanes, or earthquakes are regular occurrences, it’s important to have these plans in place well in advance so you’re not scrambling when disaster strikes. Not only will you need to be able to grab your pet and his/her emergency kit in case of an evacuation, you’ll also need to know the places in your house that are safe if (for instance) a tornado comes through and your best bet is to take cover indoors. You just need to know what parts of your house are safest for you, your family, and your pets. Even if you don’t live in a disaster-prone part of the world, however, no doubt there are occasional storms or fireworks displays that might frighten your pet – be sure to keep them indoors during things like that so they can’t run off in a panic. I have shared this article on my Facebook page (Caring Is Not Enough) so that when people are forced to leave their homes in an emergency situation, they can be prepared. My book, Caring Is Not Enough, a workbook for emergency and end- of- life planning, contains some of this information for people with pets. Your article is ad great addition. Thanks so much, Terry, for the kind words and for sharing the post with your Facebook readers!